Because many large U.S. cities are located or near lakes, rivers and other waterways, bridges are an indispensable part of our nation&#039;s transportation system. Bridge designers constantly evaluate the optimal bridge design for longer and wider bridges, and their evaluations regularly include comparisons of suspension-bridge technology and cable-stayed technology. The suspension bridge, patented in 1808 by James Finley, is an American design. Finley&rsquo;s first suspension bridge spanned Jacobs Creek, near Pittsburgh, Pennsylvania. The suspension bridge requires two cables strung across high towers on each side of the area to be bridged. The roadway is then hung on vertical suspenders attached to these suspension cables. The support towers support the weight of the suspension cable, which in turn supports the weight of the vertical suspenders and the bridge traffic. Cable-stayed bridges look a lot like suspension bridges, but their support cables tie directly to the support towers. The cantilever construction allows them to be constructed from the inside out. The cable-stayed bridge differs from a suspension bridge in that multiple towers can be easily used to extend the length of the bridge when practical. 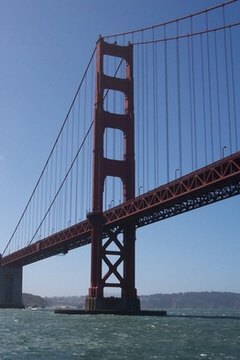 A final choice of which bridge to build depends on the bridge&#039;s desired function, cost restrictions and engineering data. Suspension bridges appear to have the advantage over cable-stayed bridges for long spans. As the span length increases, the height of the tower increases in a cable-stayed bridge without multiple towers. Cable-stayed bridges allow the construction of the individual segments of the bridge at remote locations. The suspension bridge requires the building of suspension cables across the entire span before the deck installation begins. The cable-stayed bridge has the advantage of not requiring massive anchorages at the ends of the cables. Suspension bridges require anchorages strong enough for the tension, or angular pulling, on the suspension cables. Solid rock or a large mass of stable concrete is the preferred geological base for an anchorage. These massive anchorages carry the entire weight of the bridge, and their weight must exceed the combined weight of the bridge and the vehicular load. One of the newest large suspension bridges in the U.S. spans a part of the Tacoma Narrows that once was crossed by &ldquo;Galloping Gertie,&rdquo; a bridge that self-destructed in 1940. The new bridge is the fifth-longest suspension bridge in the U.S.
Cable-stayed designs dominate most other large bridge projects. A newly proposed cable-stayed bridge called the John James Audubon Bridge would include a 2.44-mile stretch of the Mississippi river. If completed, it will be the longest of its kind in North America. Louisiana Department of Transportation and Development: "Design-build Team Proposes Record-breaking New Mississippi River Bridge"
Bell, Ronald. "What Is the Difference Between a Suspension Bridge & a Cable-Stayed Bridge?" , https://careertrend.com/about-6721625-difference-suspension-bridge-cable-stayed-bridge-.html. 30 December 2018.